My book, Picture This! 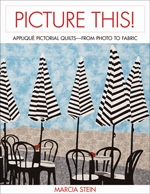 Appliqué Pictorial QuiltsFrom Photo to Fabric, is now out of print. However, copies are often available on Amazon or eBay, and C&T Publishing offers an e-book edition on its website. Based on my Picture This! workshop, I've put together all the information you'll need to create beautiful quilts inspired by your own photos, even if you don't know how to draw or consider yourself to be an artist or photographer. I cover three methods of machine appliqué (turn-under, fused, and raw-edge), and include tips on finding good subjects, improving your photos, selecting the right fabrics, and simplifying your designs. Three projects are included so that you can practice the techniques presented.